Martha Lanier was born about 1740 in Greensville County, Virginia, to Sampson Lanier, Jr. and Elizabeth Chamberlain. It appears that Martha may have been the oldest of eight siblings. Martha married John Loftin, the son of Cornelius Loftin III and Elizabeth Johnson, before 1765. Their marriage produced at least nine children. John died 03 Aug 1793 in Greensville Co, VA. He was about 53 years old at the time. 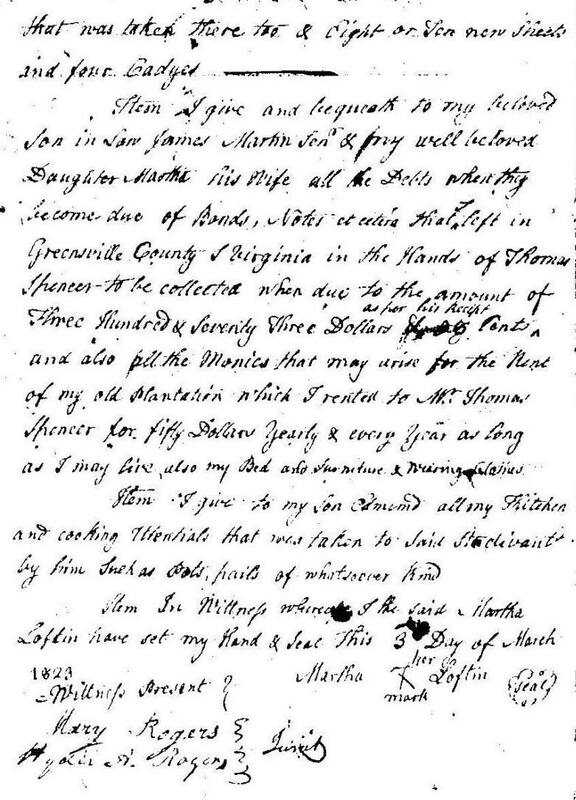 Martha lived for another thirty years after his death and died on 06 Aug 1823 in Snow Creek, Stokes Co, NC, at the age of about 83. Item, I give and bequeath to my beloved Son, Edmund Loftin, my riding Mare that I sometime drove in my chair & have delivered her to him at this place, he having drove her up in a little four wheeled waggon with me in it here to this place. I left and gave him possession of before I came away also my riding chair which I had given him possession of before I left Greensville. Item, I give and bequeath to said Edmund Loftin my Cubbord & ______ that I left at my other house in Greensville County & my folding Table, and my seven Walnut Chairs with stuffed bottoms. 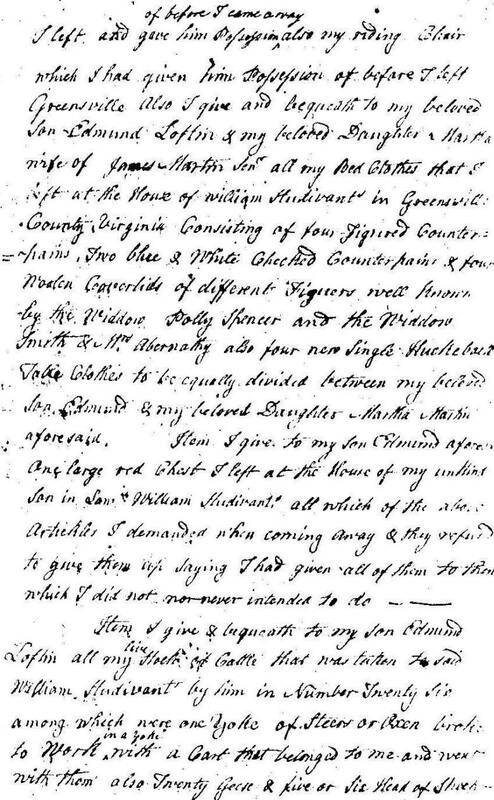 Also I give and bequeath to my beloved Son - Edmund Loftin & my beloved Daughter, Martha, wife of James Martin, Sen., all my bed clothes that I left at the house of William Studivant in Greensville County, Virginia, consisting of four Figured Counter pains, two blue & white checked Counter pains & four muslen coverlids of different figuers well known by the Widdow Polly Spencer and the Widdow Smith & Mrs. Abernathy, also four new single Huckeback Table cloths to be equally divided between my beloved Son, Edmund & my beloved Daughter Martha Martin aforesaid. Item, I give & bequeath to my Son Edmund Loftin all of my live stock and cattle that was taken to said William Studivant by him in Number Twenty-Six among which were one yoke of steers or oxen broke to work in a yoke with a cart that belonged to me and went with them also Twenty geese & five or six head of sheep. 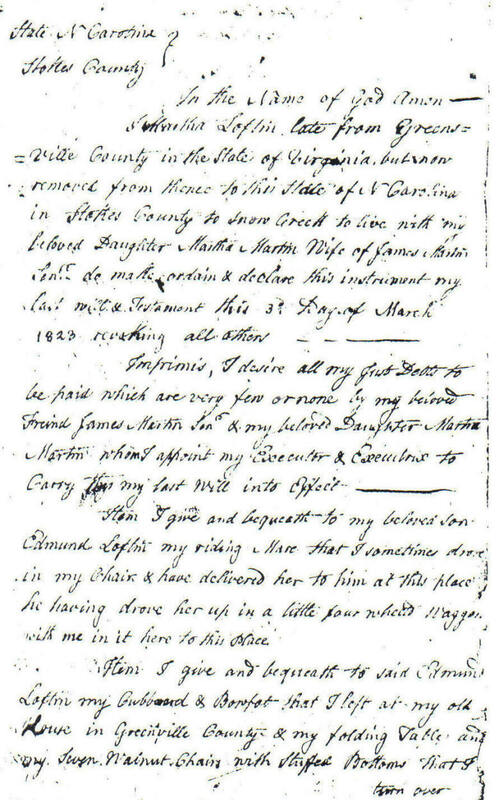 Item, I give and bequeath to my beloved Son-in-Law, James Martin, Sen., & my well beloved Daughter Martha his wife all the debts when they become due of bonds, notes, et cetera that I left in Greensville County, Virginia, in the Hands of Thomas Spencer - to be collected when due to the amount of Three Hundred & Seventy Three Dollars & _______ Cents, as for his recipt and also all the monies that may arise for the rent of my old plantation which I rented to Wm. Thomas Spencer for fifty Dollars Yearly & every year as long as I may live, also my Bed and Furniture & wearing clothes. Item, I give to my Son Edmund all my Kitchen and cooking Utientials that was taken to said Studivant by him such as pots, pails of whatsoever kind. Item, In Wittness thereby I the said Martha Loftin have set my hand & seal this 3 Day of March 1823. It's been suggested that Martha's Great-Great-Great-Great-Grandfather was Sir Lawrence Washington, the Great-Great-Great-Grandfather of George Washington - the first President of the United States. Thanks to Renee Loftin Clemmer for the copy of Martha's Will.